· You have started trying to eat healthier as part of a New Year's Resolution. · You ate so many sweets and whatever you wanted before the new year that you are overcoming an addiction to sweets. · You are trying to make healthier food for your whole family. If you have to suffer, so do they! · Your kids and/or spouse are probably also addicted to sugar and eating whatever they wanted so they are having a hard time too. · You are having a hard time getting your kids to eat their vegetables. Are any of you still with me? This seems to be what I am going through as of late and I needed some help with ideas of how to get my littles to eat their veggies. Let's just say in our family December was not the most nutrient dense meals month we have ever had. Probably the worst, in fact, for the whole year. So we need to up our game and get them back on the healthy eating train. Vegetables are so incredibly good for all bodies of all ages so here are some ideas to get your kids (or you if you are struggling too!) to eat more veggies. 1. Serve them Frozen! -- Sometimes you just need to try something you've never done before. Maybe it's the cold/crunchy feeling of the veggies they're eating, but my toddler will gobble up some frozen vegetables (blueberries too) right up. Try it out or you'll never know if this might work for your kids. 2. 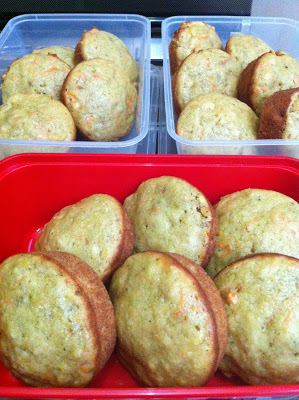 Make Veggie Muffins - This recipe is posted at the bottom and is filled with tons of veggies. It is probably the best for toddler age, maybe not for your picky eaters, but is a great way to get your little ones to eat some veggies. 3. 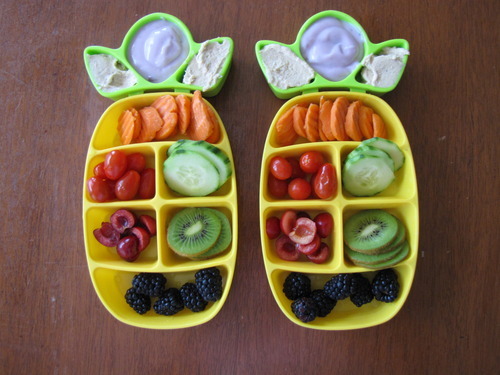 Serve Them As Snacks - You could leave a plate of raw veggies on the table for the kids to snack on between meals. If they are hungry between meals (and kids always are), they have to eat their veggies! 4. Serve Them First - Put Vegetables on the kid's dinner plates before anything else, that way, they have to finish the veggies, before they get the meat or anything else for dinner. 5. Serve Them In A Tray --- Serve all types of chopped vegetables and foods in an ice tray or muffin tin, with some yummy dipping sauces on the ends. Making it fun, colorful and full of variety can encourage little ones to eat more vegetables. 6. Hide Them - Sneak them in things like spaghetti and lasagna. The color and taste of tomato sauce covers a multitude of other things and they hardly notice. 7. Make them cute! 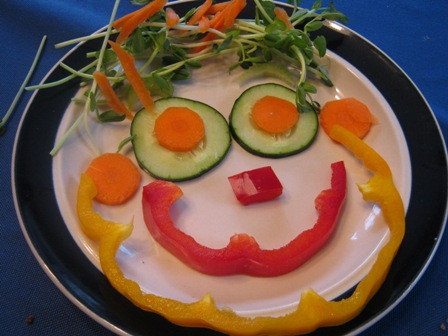 - Make some fun designs in their veggies to make the child's first reaction to giggle, not spit it out! 8. Let Kids Help In The Kitchen - Not only does helping in the kitchen teach some life skills, it also allows your child to be a part of the cooking process. This gives them a sense of pride and EAGERNESS to try out what they helped prepare. They will probably actually snack on some of the ingredients (chopped veggies, tomatoes, etc.) as you're cooking. 1. Mix all-purpose flour, baking soda, and salt in a large bowl. Set aside. 2. Mix sugar, softened butter, and eggs in a separate smaller bowl. Set aside. 3. Chop up broccoli-frozen/thawed or fresh/steamed (I used fresh). Combine the broccoli cuts with juice (I used an apple-pear juice) into a food processor. A blender works also. You should end up with 1/2 cup of puree when you're done. 4. Smash up bananas and add vanilla extract. 5. Grate carrots. It took 2 smaller sized carrots for me. Once all of your ingredients are ready, combine them all together in the large bowl that has your dry ingredients. Mix until well-combined. Scoop the mixture into a prepared muffin pan. I usually coat my muffin tins with a little bit of canola oil. Bake them at 350 degrees for 25-30 minutes.